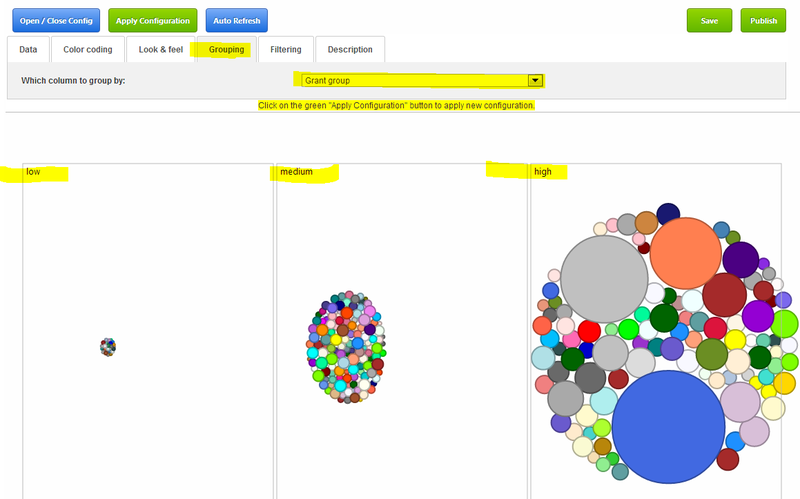 Some visualizations has the ability to filter, sort and group items. When filtering is applied, only items that satisfy the filtering condition will be visible on the screen. Sorting supports number, text and datetime, in both ascending (small to large) and descending (large to small) order. Only one sort is allowed. When grouping is applied, sorting will happen within the group. Data can be visually grouped, each unique value in the grouping column will create a group. In the following example, there are three unique values in the column “Grant group”, low/medium/high. So, three grouping boxes are created.